Welcome to this week's installment of How to Cook Something, my feature where I prepare one recipe per week from my favorite beginner's cookbook, How to Cook Everything by Mark Bittman. I started this adventure in a structured effort to learn my way around the kitchen, and I'm happy to say it's working so far. 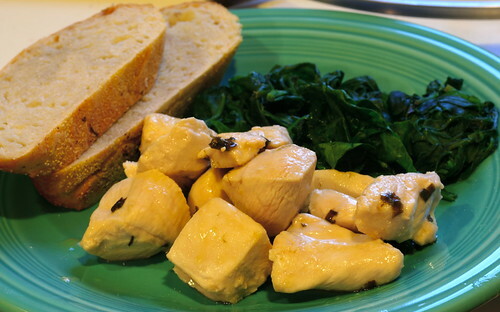 This week's pick is Chicken in Lemon Sauce. I made a few changes to the recipe, namely using chives (from my herb garden) instead of leeks, and halving the amount of butter. My changes are reflected below. I belong to the school of thought that you can't go wrong with a white wine lemon butter chive sauce. You just can't. 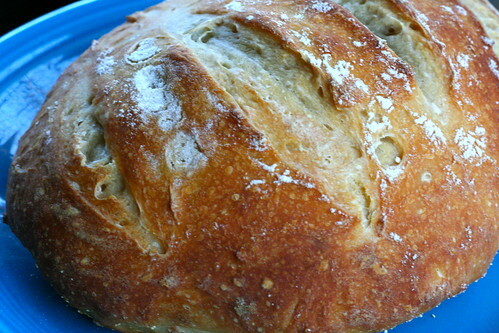 To go along with the chicken, I baked up an Artisan Bread in 5 boule and sauteed some fresh local organic spinach. I squeezed half a lemon over the spinach and sprinkled it with some garlic salt right before taking it off the heat. It might be my new go-to veggie dish, it couldn't have been easier and was really flavorful. We're off on a whirlwind trip to NYC for the holiday weekend to see family and friends. See you all next week! A more-or-less traditional Provencal preparation, one that must be served with good bread, or at least a spoon for the sauce. 1. Melt butter or heat oil in a large skillet over medium heat. Add chives and cook, stirring, until softened, about 3 minutes. Add the wine, stock or water, and thyme; bring to a boil and let bubble for a minute or two. 2. Add the chicken, turn the heat to medium low, cover, and simmer until the meat is barely cooked through, 5 or 6 minutes. Remove the chicken with a slotted spoon, set aside and keep warm. 3. Turn the heat to high and cook the sauce rapidly, stirring occasionally, until just about 3/4 c. remains; this will take 5-10 minutes. Lower the heat to medium-low, add the lemon juice. 4. 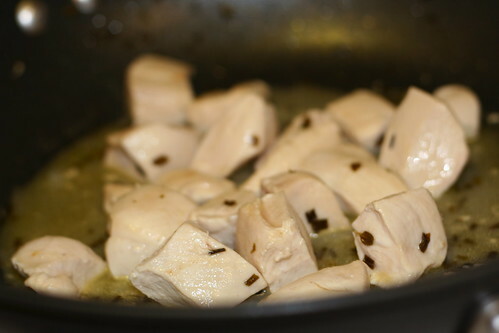 Season with salt and pepper and return the chicken chunks to the sauce to heat through. Do not overcook. Garnish and serve immediately. I love a little white wine lemon butter sauce myself! Have a great trip!